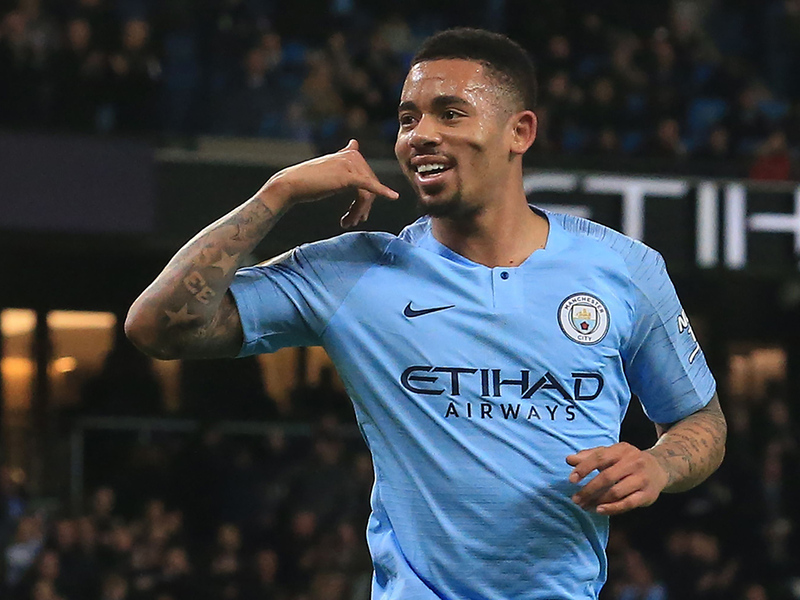 Manchester: Gabriel Jesus extended his productive start to the new year, scoring twice as Manchester City comfortably dealt with 10-man Wolves 3-0 to cut Liverpool’s Premier League lead to four points. The Brazilian scored twice in the first half, either side of a straight red card for Wolves’ French defender Willy Boly, as Pep Guadiola’s team demonstrated that their shaky December form has been banished. Two weeks into 2019, City have scored 21 goals in four home games already this year. They have hit 99 in all competitions this season. The City manager could afford the luxury of starting with Kevin De Bruyne and Sergio Aguero on the bench, even though the pair have recovered from recent injuries. Jesus had scored just three times in his 16 league games coming into the New Year but his two-goal performance against Nuno Espirito Santo’s team not only boosted that statistic but also continued his incredible vein of recent form. Scorer of one goal in the seven-goal FA Cup win over Rotherham and four in last week’s 9-0 humiliation of Burton in the League Cup, Jesus now has seven goals in his past three outings. City’s task was made easier by a straight red card shown to Boly in the 19th minute but, even at that early point, Guardiola’s side were a goal to the good and in cruise control. Jesus’s opener came in the 10th minute after a magnificent 40-yard pass from defender Aymeric Laporte exposed the Wolves defence and sent Leroy Sane sprinting down the left. The German’s low cross was judged to perfection, as was Jesus’s run, as he slid in and steered the ball into an open goal. Boly’s rash challenge, an out-of control, one-footed lunge at Bernardo Silva, may not have been malicious but was deserving of a red soon after. And when Jesus and City scored the second of their evening, from a 39th minute penalty, it was hard to see Wolves forcing their way back. Again, referee Craig Pawson appeared to have made the right decision as Raheem Sterling played a one-two only to be brought down by Ryan Bennett’s clumsy challenge. Jesus took a stuttering run-up for his spot kick, but there was nothing hesitant in his confident finish into the bottom right corner. Wolves had shown the audacity to threaten the City goal, when only trailing 1-0, on a counter-attack which ended with Diogo Jota coming within inches of connecting with Jonny’s through ball. Yet that was a rare moment of relief for the visitors and keeper Rui Patricio, whose best first half save saw him tip over a 25-yard striker from David Silva. The Spanish international was making his 267th Premier League appearance for City - the most in the club’s history, beating the mark of former goalkeeper Joe Hart, although still a long way behind Alan Oakes, who played in the old first division between 1959 and 1976. But the main pre-match talking point had surrounded the absence of De Bruyne, left on the bench despite the obvious importance of the fixture to City’s title aspirations. The Belgian had been substituted early during last week’s League Cup landslide against Burton and had appeared to show his dissatisfaction to his manager by storming down the tunnel after being replaced. If the City manager intended De Bruyne’s absence to represent a punishment of sorts, it was relatively short-lived, with the Belgian brought on to replace David Silva just after the hour. De Bruyne wasted little time in attempting to make his mark, with a ferocious rising shot sailing over the bar from just inside the Wolves area. And the Belgian also had a key role in the third goal of the evening when his dangerous cross, following a 77th minute short corner, was deflected into his own goal by Conor Coady.